How are you doing today? Is it hot where you are? It's 97 degrees here in New Jersey today. Plenty hot! I cleaned our pool this morning, and had to do some sweeping in the VERY hot attic. We had roofers here yesterday, and they left a bit of a mess up there. 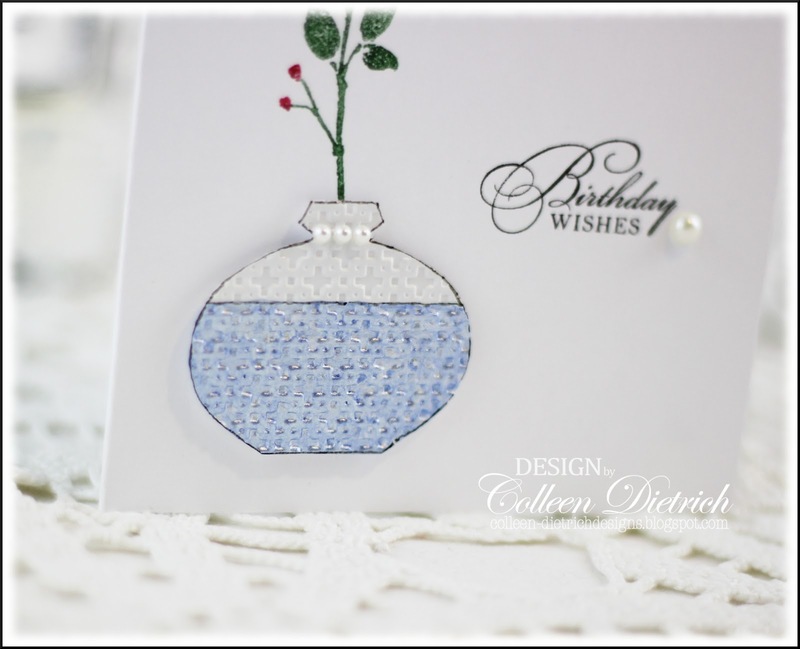 It's a simple birthday card, using some neglected things: the Stampin' Up! set Watercolor Trio, and this embossed punched piece. It came from one of those awesome $1.00 Scrap Bags from my SU demo. All I did was add "water" in the form of shimmer paint, and some pearls. On that embossed punch, I painted a coat of Creative Inspirations' Tanzanite shimmer paint, and then a coat of Winter Frost, to lighten it up. This is Papercraft Star's anniversary week, and each day there is a new challenge (all are open until July 9th). I thought I would be unable to join this 'Cool Drink' challenge, because I don't have any drink stamps, but Sylvia helped me think outside the box, er, drinking glass. Love the vase and all the white space :) Enjoy the pool!!! aww another beauty...that vase is amazing...lovely card. I don't have any drink stamps, either, but my hubby helped me come up with an idea that I cannot wait to try out! Yours is uber gorgeous! LOVE the way your blues and reds really pop on that white base! Yum! I want a $1 scrap bag with stuff like that in it!!! Love the way you painted the vase- make me want to go paint on myself. Lovely and sweet birthday card. Hugz!!!! Love everything about this card, Colleen. It's simple and clean. I like how you added some bling to the vase - very pretty. 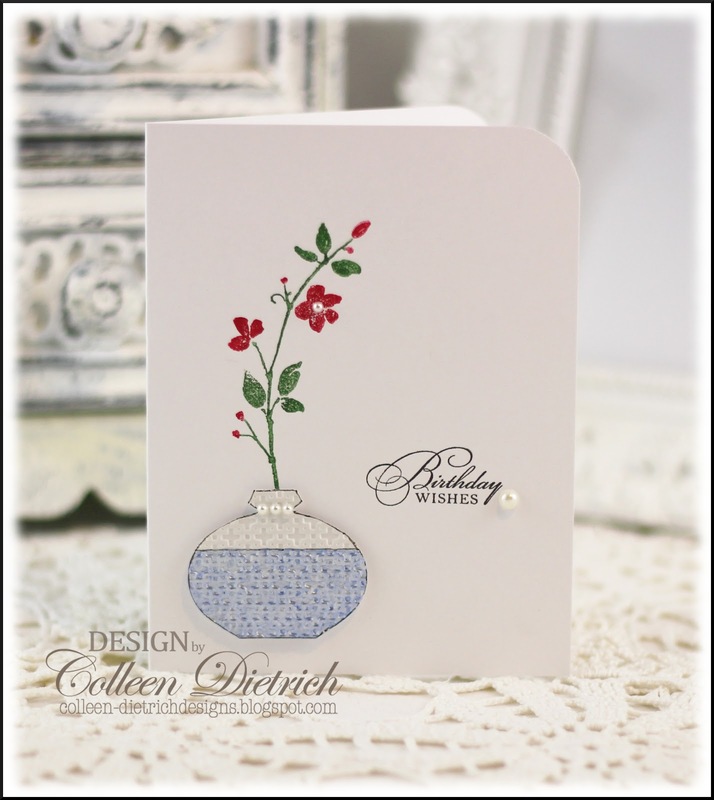 Great CAS card Colleen, love the little pearls and pop of red from your flowers! Fabulous card, Colleen, yes even the flowers get a "cool drink". I watch my cats everyday as they grab a drink, the birds at the bird bath, it is just a matter of imagination and interpretation. So glad you joined in the fun this week helping us celebrate the 2nd anniversary of the Paper Craft Star by playing my Challenge! Hope to see you tomorrow for Anitra's challenge! Love your idea of thinking outside of the box! Too funny but I would think it counts! I love that shimmer paint - looks so cool! Pun indended! The pearls are a fun touch too. Love the crisp lines too and the pop of color for the flowers. Great job as always! Gorgeous shimmer and delicate design Colleen! I love the added pearls. Very clean and simple and pretty! Love your choice of red for the flowers. So beautiful against all that glorious white. This is such a lovely card. I just love the simplicity of it. Very pretty CAS birthday card Colleen! Beauifully CAS. I love your vase with the pretty shimmer. So sweet! Love the simplicity against the white background. What a beautiful vase with the embossing and pearl "necklace". It's perfect with the red flowers! This is one of my all time favorite sets. I was so sad when it didn't make it in the big book. Wow! I am starting to love CAS. This is so elegantly simple. I just love it! How lovely, clean, and simple, Colleen! This is beautifully CAS. And isn't your sweet little vase clever? This is such a beautiful, sweet card. I love all the white space. That vase is just gorgeous, and how striking with the slender red flower. Thanks for playing along with my challenge at The Paper Dolls, and please accept my apologies for the lateness of my comment. This is the most stunning card! That single stem of flower is so perfect and the vase is beautiful too. Great job!